Details relating to the Luxembourg Commemorative of 2012. This coin has been minted on occasion of the marriage of the Heir Grand Duke Guillaume to Stéphanie de Lannoy. The inner circle shows Stéphanie of Luxembourg and the Hereditary Grand Duke Guillaume of Luxembourg (on the right) as well as the Grand Duke Henri. It is obligatory for all the coins of Luxembourg to show the reigning Grand Duke. The representation is a copy of the photo taken at the official celebrations of the engagement at Palace Berg. The minting uses a method which allows realistic images to be made. At the bottom of the inner circle we see the mint year 2012 flanked by the mint mark and the initials of the mint master. An interesting point - The EU allowed the minting of two Commemorative Coins per year as from 2013 but Luxembourg managed to have what should have been the first of their 2013 commemoratives, issued at the end of 2012. It is thus the only EU country to have issued two commemoratives in 2012. I saw no point in altering the tables for this one abberation and hence this page is accessed via a 2013 link - sorry if that has caused any confusion. 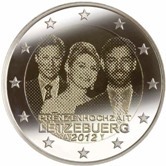 From Luxembourg Commemorative 2012 to euro coin collector.